You'll have quite a few opportunities this year to look up and see some beautiful celestial events. A meteor shower is a stream of cosmic debris called meteoroids entering Earth's atmosphere at extremely high speeds on parallel trajectories. Meteor showers are best observed after midnight with a new moon. On nights where the moon is bright (full), they are harder to see. Here are the dates of some meteor showers visible in the Northern Hemisphere this year. The moons fullness is included, but it's too soon to forecast cloud cover. On these nights, the moon will be 91.99 percent full. The Lyrids are a medium strength shower that usually produces good rates for three nights centered on the maximum. On this night, the moon will be 6.40 percent full. The Alpha Capricornids are active from July 3 through Aug. 15 with a "plateau-like" maximum centered on July 30. This shower is not very strong and rarely produces in excess of five shower members per hour. What is notable about this shower is the number of bright fireballs produced during its activity period. On these nights, the moon will be 94.20 percent full. 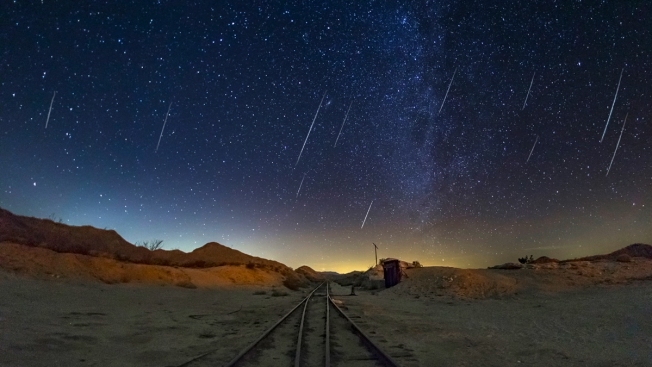 The Perseids are the most popular meteor shower as they peak on warm August nights. They are active from July 17 to Aug. 24. Normal rates seen from rural locations range from 50-75 shower members per hour. The moon will be 86.85 percent full. This one may be hard to see though. The shower is active for more than two months but rarely produces more than five shower members per hour. On this night, the moon will be 44.66 percent full. The Orionids are a medium strength shower. In a normal year the Orionids produce 10-20 shower members. The moon will be 99.65 percent full. The Geminids, Dec. 13-14, 2019. The moon will be 96.31 percent full. The Geminids are usually the strongest meteor shower of the year. This is the one major shower that provides good activity prior to midnight as the constellation of Gemini is well placed from 22:00 onward. The Geminids are often bright and intensely colored. The Ursids, Dec. 21-22, 2019. The moon will be 20.29 percent full. The Ursids are often neglected due to the fact it peaks just before Christmas and the rates are much less than the Geminds.